Are you in the process of leading change at work? You cannot be leading change if you don’t have the roadmap to lead a successful change. With the roadmap, you need to build in a number of important questions to ask first. Here are the 35 questions that you must ask first in leading change. Leading change is now a common occurrence in every organization. In recent years, technological growth, the information age, changes in habits, changes in global economy and the business environment have forced organizations to change the way they do business. As a leader, like it or not, change is here to stay so it is imperative that you know how to successfully handle or lead change. Leading change is imperative for organizations because any company that will not change risk being left behind and possible closure because their strategies, structures, systems, and organizational culture will grow increasingly obsolete. Unfortunately, in all companies, managers and supervisors are the ones who have to be seen as leading change or implementing any change cascaded down to them by CEOs or Directors. However, the traditional skills possessed by most managers do not include that of being an effective Change Agent or Change Leader. In these rapidly changing times, having a ‘change management’ skill is important for all managers more than ever before. As a matter of fact, some people seem to come programmed with a basic distrust of anything or any change and will work frantically openly or behind closed doors to preserve “the way things used to be around here”. For this reason, leading change or managing any organizational change does not come easy to managers, so as many as two-thirds of organizational change management efforts fail. As a leader, are you currently leading change? If you are in charge of change, it is important to realize that people are the driving force in any successful change. The most difficult aspect of change is also the people aspects of change. People will always resist change because change means a new way of doing things. Resisting change is natural because as people, we fear the unfamiliar and we are afraid that we will be unable to cope in the new situation. 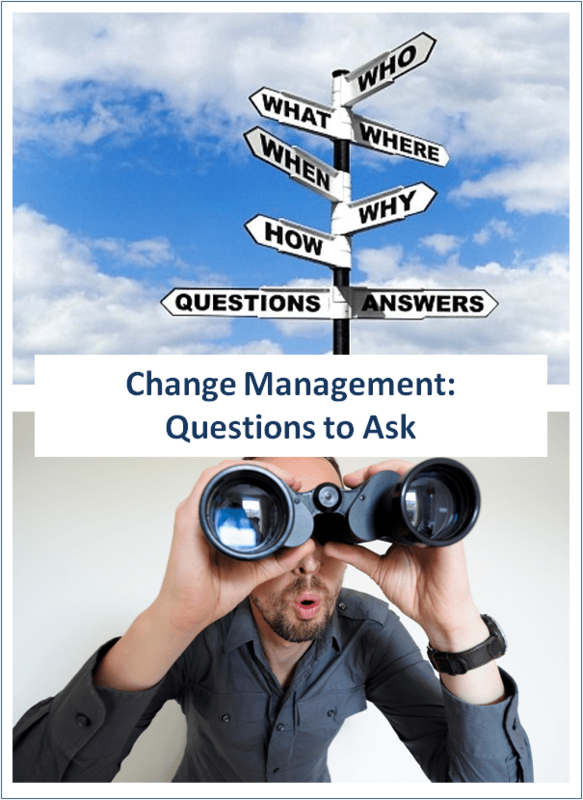 If you are a manager leading change and you don’t know how to deal with an impending change or any change, the 35 questions below are for you. First, ask yourself these 35 questions and answer them as objectively and frankly as possible. Then, get a trusted mentor to go through your answer(s) for each of the questions and coach you through the ones that you struggle to answer favourably. Unless you can confidently answer all these 35 questions before you implement a change, you may be setting yourself up to fail. When leading change, the first step in the change process is to confirm as objectively as possible that change is really what the organization requires and that you are the right person to implement the change. 1. Have I got logical and compelling reasons for the change and what are they? 2. Do I fully understand why the change is happening? If not, why and who can painstakingly explain to me? 3. How can I communicate why the change is happening in a convincing manner to people? 4. How is the proposed change aligned with our organizational strategy plan? 5. How can I build a solid business case for the change? 6. What’s the best way to establish a sense of urgency? 7. How do I prepare a roadmap for the change? 8. With the reasons for change, can I paint a picture of what success will be like for people? 9. What are the barriers and implications to a successful implementation of the change? 10. What is the ‘WIIFM’ of the change for people and the organization? 11. Who will feel threatened by the change and how will I deal with their concerns? 12. Who are the supporters of the change and how can I leverage their support? 13. What do I need to do in order to let the key supporters of the change help drive the change with me? 14. What are the resources readily available for the change and how am I going to utilize them? 15. Can I set the stage for change now and how? 16. What is expected of my guiding coalition and have I informed one? 17. How can I prepare a solid communication plan utilizing the ABCDE model of communications? 18. Do I need to bring in an outside party to help with the change and why? 19. What are my plans in order of priority to manage resistance? 20. Can I be as open, honest and transparent as possible? If not, what can I do to manage transparency? 21. Can I communicate bad news if I have to? If not, who in a position of authority that can help to communicate bad news? 22. Will I be generous with the time and effort that I have to handle the change correctly? If not, what can I do to address my workload so that I can devote the time needed to implement the change successfully? 23. What can I do to keep the information flow frequent, timely and clear to all stakeholders and also listen to their concerns? 24. How can I form a steering committee comprising of representatives of all the parties to be affected by the change and involve them in its planning and implementation at the earliest stages? 25. How can I leverage employees’ knowledge and empowerment? 26. Will I and the other leaders involved be visible leaders, can we come out of the boardroom to the shop floor? If not, what do we need to do to be visible to our people during this change? 27. Can we all maintain an open door? If not, why not and what can we do to address this? 28. Am I willing to explore resistance to change and derive good solutions accordingly? If not, who can I involve to help derive good solutions? 29. How can I motivate and support people during this change? 30. How can I involve some of the people affected by the change? 31. How can I arrange for people to be coached and supported during the change? 32. What will I do to recognize and reward achievements? 33. Have I thought of how to make this change stick – how? 34. Have I incorporated new values and attitudes to weave into our culture so they are embedded? If not, what do I need to get this done? 35. Later, how do I review the change and capture any lessons learned? It takes time to build employees’ trust but only moments to destroy it. To build trust, you need to be honest, open and generous with your communication. Even when your employees trust you, they won’t change unless you give them a compelling reason to change. If you miss this opportunity, employees will fabricate their own reasons which are usually negative and disruptive to the change. You can’t implement change without involving people who are directly affected by the change. Don’t assume that your negative people will necessarily sabotage the change. They are very good with coming up with reasons why you have to leave no stones unturned. They will only undermine the change if you let them, as a manager leading change, it’s your job to gain buy-in. You may not like some of the things they say, especially during the denial and resistance stages. However, acknowledging their fears is a good way to minimize their anxiety. During change, communication is king. Reiteration is powerful because people hear a message when they are ready to hear it. Are there other questions that should be asked before embarking on change? If there are, let’s hear from you. Add your comment below or simply share this post. Now that you have explored these 35 questions to ask if leading change, do you have any more questions to add? If so, feel free to add your comments below. There is no doubt that these are critical questions for all leaders to ask before they lead any change because 70% of all change initiatives fail in organizations. These are great open ended change questions, thank you.